TWO-TIME Everest Champion Redzel will face 13 rivals as he looks to defend his title in the Group 1 VRC Sprint at Flemington on Saturday and become the first horse since Black Caviar to win the coveted sprint back-to-back. Melbourne Cup winning jockey Kerrin McEvoy takes his customary position in the saddle for the leading son of Snitzel, who as markets opened was the $5 favourite for the race alongside Sydney Stakes winner Pierata. Redzel backed up his historic first Everest win in 2017 with victory down the Flemington straight a month later, with the race then known as the Darley Classic, and will jump from barrier 8 in a bid to repeat the feat on Saturday as he looks to claim his third Group 1 success. 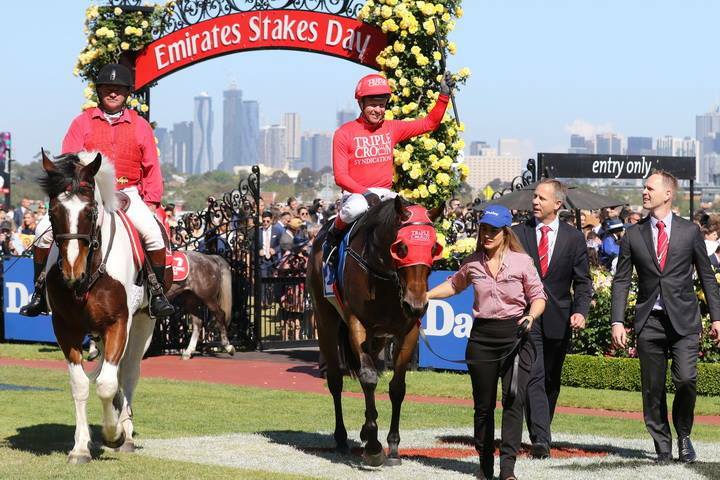 Redzel became the second highest earning horse in Australian racing as he took victory for his second Everest, and will take is prizemoney total to just shy of $16 million with a win in the Group 1 feature sprint. Co-trainer Peter Snowden has been happy with Redzel’s progress since he conquered Everest once again on October 13. “He’s come through his Everest win really well,” said Snowden. “He’s been bright in his work and still looks fantastic in himself. “He backed up really well in this race last time and his preparation for this has been spot on. He worked well Tuesday and his trial was just what we wanted so I’m very happy with the horse.